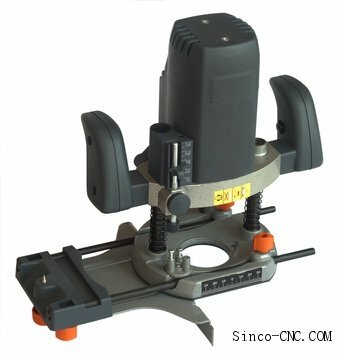 Vertical milling machines have a cutting blade that is vertically positioned over a table. The blade points directly down into the surface of the metal that it is going to cut.This allows different sections of the object to be cut, drilled or carved away by the cutting tool. This is the most common milling machine. The horizontal milling machine has a cutting blade that points straight out at a 90 degree angle horizontally from the machine. It moves up and down while the table that holds the object that is being cut moves from side to side. The column mill is one of the simplest types of milling machines. It has one long pillar that suspends the cutting tool over the cutting surface. It is a vertical mill, used for drilling bores into metal, shaping small metal tools and other uses.It is very small and can fit on a home work bench. A combination milling machine combines both aspects of the horizontal and vertical millers. It can have different configurations, but one common one is the addition of a vertical and horizontal cutting blade that can be positioned to make simultaneous cuts.This allows for more range and higher precision in some cases. A turret mill is a more versatile mill that is commonly known as a Bridgeport milling machine. Its spindle has more range of motion and can be set into a variety of positions. This makes the mill a little more flexible and allows it to create more products.